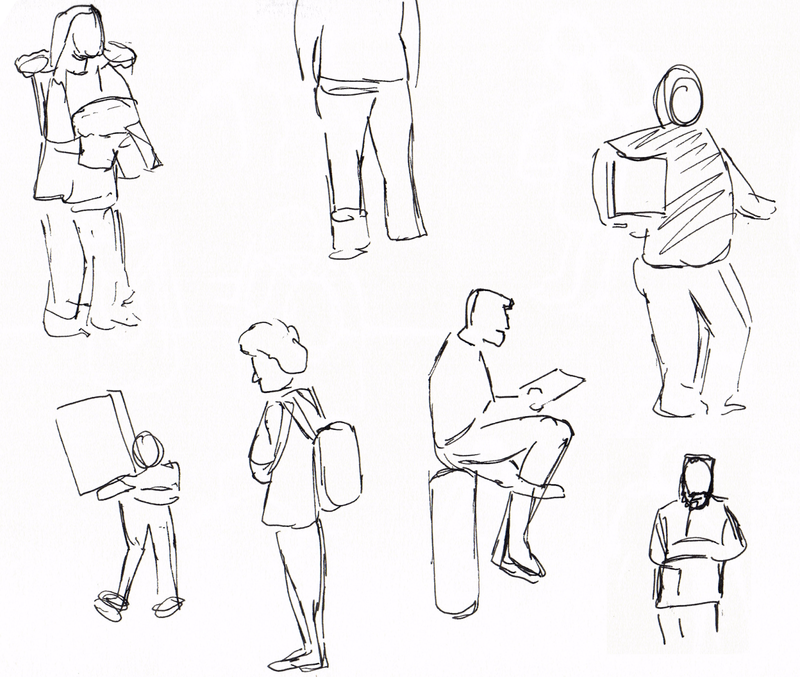 Today’s class task was “Live Drawing”, where you sit in a public place and quickly sketch people as they walk by or hang around in the area. The focus is not in accuracy but at capturing the essence of the person in the moment. I headed first to the lobby in Abertay’s Kydd Building knowing that people will be passing through. My favourite drawing here is the lady resting her elbows on the table, although she was just resting her head on her arms it appears she is enjoying a good sandwich here. There was the odd lull in activity and not much variation in the angles people were facing (mostly just to the receptionist) so I made my way across the road to Bar One (where a large number of the class were already located). There were many people walking outside doing a variation of things, each with their own little story. 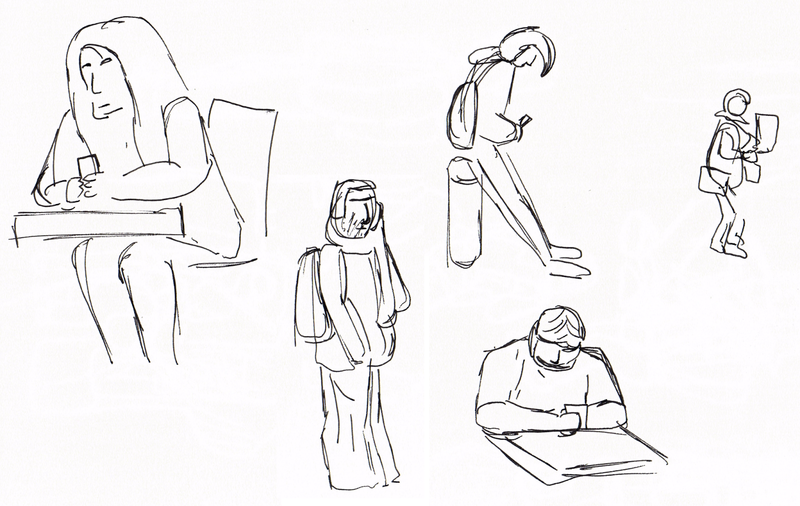 I became more comfortable with drawing people here so there are some more interesting sketches going on here. For the sake of variety and wanting to go somewhere different I headed to the first floor of the library and sat in front of the window to draw. 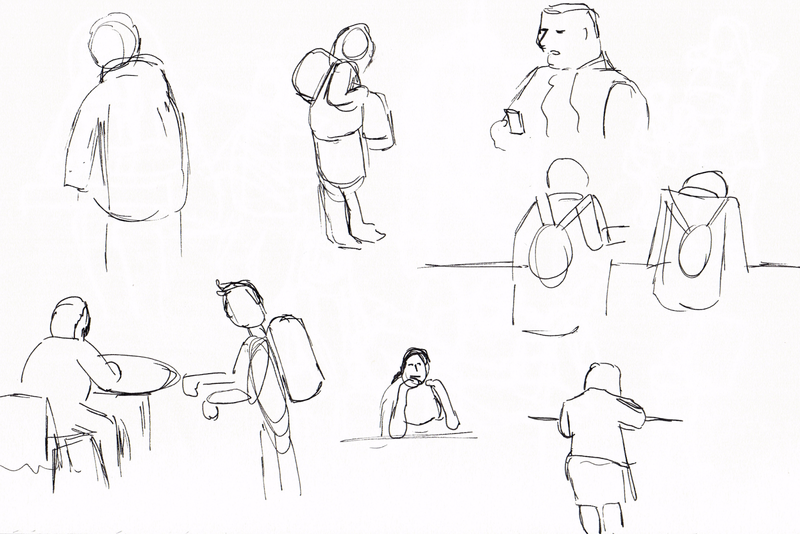 People were closer up and generally paused for a little longer giving me a quick chance to sketch them out before they moved on. 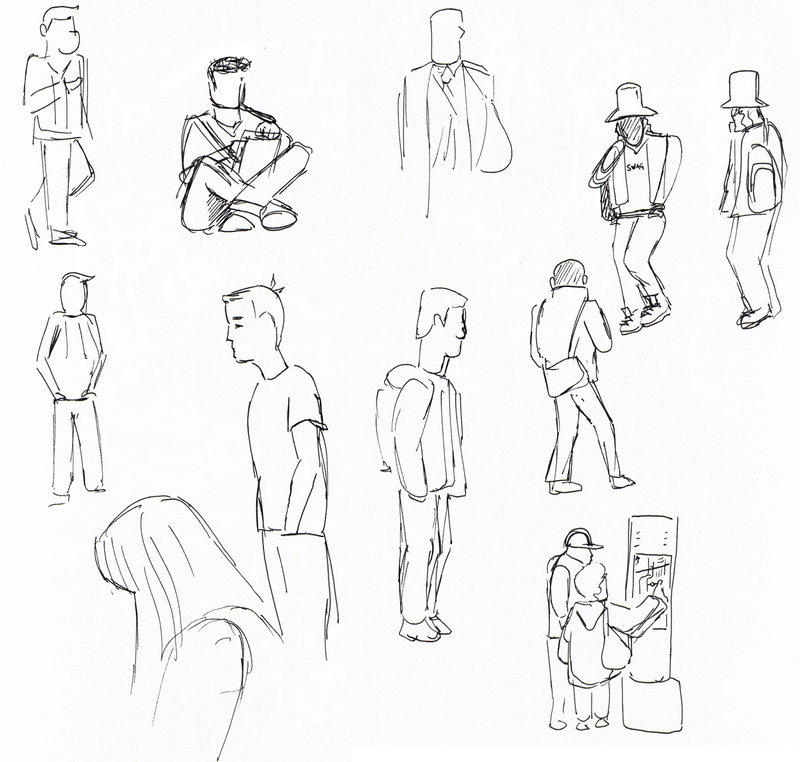 I came up with a lot more interesting sketches here so I have a few favourites including the suited man with a simple rectangular face (and nose) as well as the ridiculously dressed student with hilarious hat. The old couple that spent some time at the town map where so characterised they were adorable to draw. The first aim I think I achieved well. The entire exercise was something I got better with as the class went on with the more interesting and better sketches coming later on as I was more comfortable with the task. Although I could have filled out a few more sketches the problem with getting this done was mainly in relation to the second aim. Capturing a sense of movement was a slightly challenge, mainly because of how fast people walk and how trying to take a snapshot and draw them in that pose is tough. 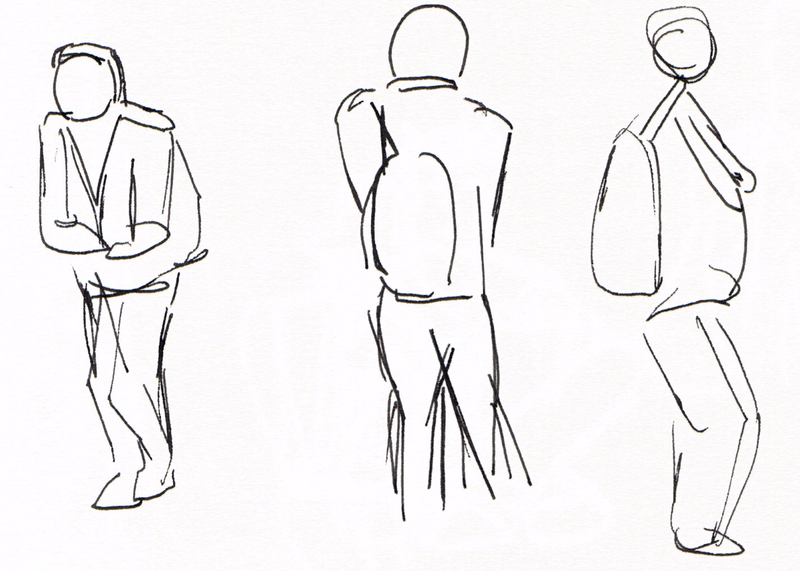 I would’ve like to have tried drawing one person walking over a distance in multiple poses even if I didn’t manage to get all their limbs in each time. Capturing the sense of personality and character in a sketch came from how the person was drawn, as in which bits were focused on or even exaggerated. This was something I think got better over time with my more interesting drawings coming out at the end.